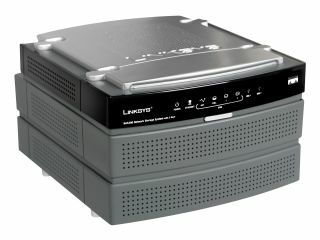 Linksys showed us the NAS200 Network Storage System that enables you to plug in SATA drives to share files and folders. The company also demonstrated its WRT350N Wireless-N router that enables you to share any USB hard drive. Both will make their UK debut in the Spring. The two-bay NAS200 enables you to plug in two SATA drives. There are also two USB slots for additional storage capacity. Backup of important files is done with the touch of a button. However, there is no wireless. We had a go with one and were impressed at quite how easy it was to fit the drives - simply pull off the cover, attach the cable and slide it in. Linksys also showed us a Wireless-N router specifically intended for gaming - the WRT330N . However, it's unclear whether this will make it to the UK.